WINE and dine at Villa Danieli Sheraton Imperial Kuala Lumpur from now until Oct 31 and get treated to a five-course meal paired with wine finely-tailored by the hotel?s wine connoisseurs. From a selection of Frescobaldi wines from the vineyards of Tuscany, diners will be served a different wine with every course served. Sit back, relax and immerse in the Italian trattoria-styled restaurant while the head chef, Alessandro Graziosi, whips up his specialties. ?This is our second one-off promotion this year, so come and try it out. Our previous one was held in March,? said Sheraton Imperial Kuala Lumpur marketing manager Shirley Khor. She explained that the dishes served during this promotion was not usually found in the menu and was of the chef?s own creation. For starters, diners will be treated to amuse-bouche, a bite-sized appetiser also known as hors d?oeuvre in French. Only in October : Sheraton Imperial Kuala Lumpur executive sous chef Kamaruddin Adnin showing the fish and ravioli dish, which is part of the five-course set meal promotion. Unlike most appetisers, amuse-bouche is normally served by the chef for free, and are often accompanied by a complementing wine from the chef?s selection. For this menu, the chef came up with Mantecato di Merluzzo e cavolfiori con chips di Baccala, served with a saucer of pesto and a bread basket. This amuse-bouche, consisting of creamed cod and cauliflower mash, was a delight when eaten with the freshly baked breads served. Topped with crispy salted cod chips, which were a tad too salty, the bite-sized opening course went well with the white wine Remole Bianco (Vermentino & Tribiano) 2012. Next up was the antipasto, the opening course to every formal Italian meal. For this menu, diners will get two different antipasto consisting of a salmon and a tuna dish. Paired with the white Pomino Bianco (Chardonnay and Pinot Bianco) 2011, both the salmon and tuna went down well with the smooth texture of this wine. Sweet and smoky: The beetroot with smoked salmon antipasto. 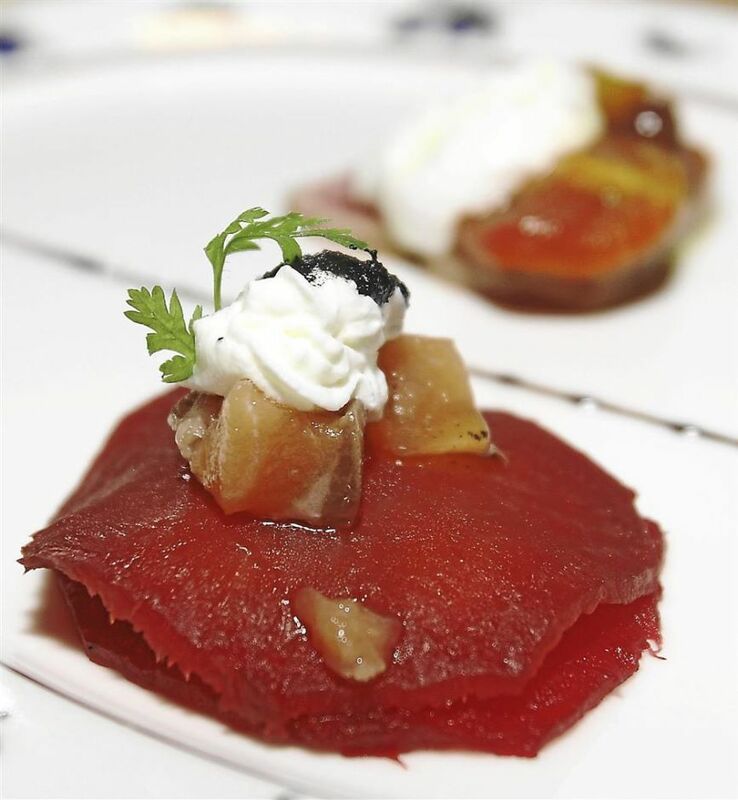 For the tuna, the chef laid down two slices of raw meat (food tasting portion) topped with cherry tomatoes and extra virgin olive oil mousse. The tip is to eat the tuna and the white mousse topping with tomatoes all in one bite to get the most out of the fusion of flavours. On the other side of the plate were slices of beetroot with smoked salmon sandwiched in the middle. The slightly crunchy beetroot went well with the salmon, tasting a little sweet and smoky at the same time. Then came the third course, which consisted of potato ravioli cooked with light pepper goat cheese fondue and topped with crispy cured beef ham. For the food-tasting portion, we were served two slices of squared ravioli topped with the creamy sauce and rocket leaves. This dish was paired with the red Tenuta Di Castiglioni IGT 2009 wine. 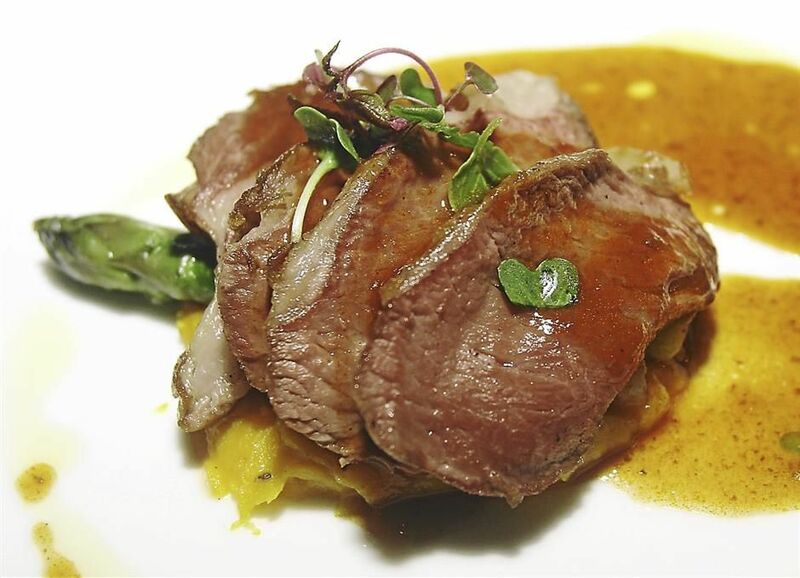 Right after the ravioli, came slices of medium rare pan-roast lamb rump served with thyme pumpkin puree and sauteed asparagus. The pumpkin tasted sweet and went really well with the lamb, which was drizzled with citrus glazed lamb juice. As it is red meat, it would only be fitting to pair this dish with a red wine; Castelgiocond Brunello di Montalcino DOCG 2005. For dessert, small pears and custard cream sable pie is served, together with frozen yogurt mousse. Since it is dessert, Illyquore coffee liqueur was served to help wash down the pie. All in all, this five-course set menu costs RM220++ per person, including the four glasses of wine and coffee liqueur. The restaurant is closed on Sundays and public holidays, while dinner is served from 6.30pm to 10.30pm on other days.